Accra (Ghana) July 19, 2018 (travelindex.com) – Routes Africa 2018 taking place in Accra Ghana saw the Seychelles former Minister St.Ange on stage to discuss aviation and tourism alongside representatives from China, Tenerife and Ghana. Alain St.Ange, the former Seychelles Minister for Tourism, Civil Aviation, Ports and Marine was invited by Routes Africa 2018 to be a panellist and share his experience after the successes made by Seychelles under his watch. Delegates at Routes Africa 2018 agreed that the Seychelles former minister spoke with ease on matter of tourism and aviation citing the Seychelles experiences and bringing home the point that airports and the tourism departments are all for the one country and needed to be guided by one vision for the benefit of the people. St.Ange addressed the need to remove obstacles to let tourism work when the question of Visas was raised and also spoke passionately about costs saying that the practice of bleeding the tourism industry was harming the industry’s growth and the economies of the destinations. 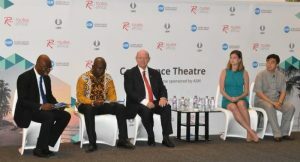 Alain St.Ange has been seen recently on tourism conferences circuit and press at the Ghana event referred to his participation and commanding Routes for having a man who led African tourism for many years sit with them answering questions and treating the subject matter based on successes he had achieved. St.Ange gave a number of press interviews after the session and spoke about the need for Africa to stand together for rewriting the narrative for Brand Africa.